KC3 Positive Label Bullying Prevention Character Ed Program is a research based Bully Prevention and Positive Character Program, proven to decrease name-calling, discipline and distraction incidents in school and on the school bus. It increases self-esteem, positive attitude and cooperation. It improves a school's atmosphere for learning and improves bus safety by decreasing distractions. It positively impacts the atmosphere in which school children, teachers and bus drivers start and spend their day. The Program has expanded beyond the curb and on to the bus and into the community. Traditional bright yellow buses are being morphed into "Mobile Positive Word Zones" as drivers complete the certification program with their riders. Home Program is available to two year participants at no additional charge. The Positive Label Program been commended by the White House, been featured on Fox News, is recommended by the Georgia Center of Character Education and is an Official Resource Project of the National Museum of Patriotism. 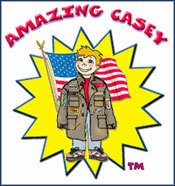 The names of Schools and Transportation teams completing their certification will be included in the "Casey Citizenship Exhibit" at the National Museum of Patriotism. Positive Label Program has multiple, fun, age-appropriate booster lessons, providing a strong foundation for creating and rewarding healthy relationship habits. It supports the goals of Second Step and Safe and Drug Free Schools. It ties easily into existing teacher lessons and supports ongoing Character Education initiatives. This "Inclusive" program supports efforts to ensure that No Child Is Left Behind. If your child's school or school bus is becoming one of America's Certified Positive Label Zones this month, we invite you to accept our gift and download a complete a mini version of the Positive Label Home Program. Go to "download" page and follow the simple instructions. Committed to positively impacting the world -- one child, one home, one school at a time. In a period of only 6 weeks 96% of the required traits can be introduced, brought to life, and practiced using the Casey story series as a foundation. "Local boards may implement such a program at any time for any grade levels, and the state board shall ncourage the implementation of such plan. All laws and parts of laws in conflict with the ACT are repealed."